In the recent review (not study) of the health impacts of wind farms, the NH&MRC renewed their call for a precautionary approach and emphasised the need for more research. This recommendation echoed their earlier Rapid review, as well as the Senate enquiry in 2011 – that more research was needed as there was a paucity of high quality studies available. This most recent review from the NH&MRC contained only one Australian study – where a farmer’s wife, STT pin-up girl, Mary Morris, put in the hard yards and got something decent done to survey the residents around the Waterloo Wind farm in South Australia (see our posts here, here and here). 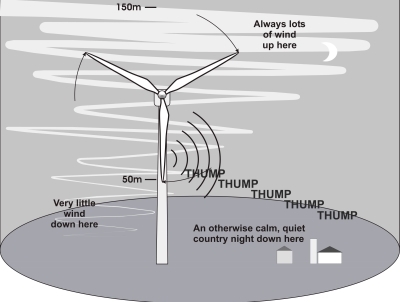 The South Australian EPA promised big, but delivered a pitiful effort in their study of the noise impact on the Waterloo wind farm (see our post here). They put their microphones in places that violated their own guidelines – such as near trees and reflective surfaces – to hide the low frequency noise and infrasound from the turbines. 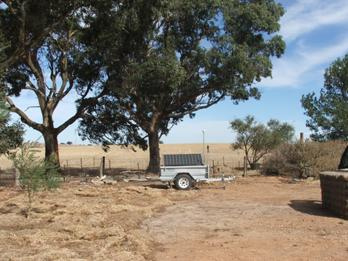 But once bitten – twice shy – the Waterloo residents also brought in acousticians from the University of Adelaide to run the sound studies at Waterloo in parallel with the disgraceful EPA work. This Channel Seven news story covers it. JOHN RIDDELL: Locals in the Mid-North are banking on independent research to confirm their claims about the health impacts of living near wind farms. They want to stop future projects in the area. Earlier results back their concerns. MARIJA JOVANOVIC: Waterloo residents have long complained of health effects from constant noise and vibration. COLIN SCHAEFER: We spend days and hours trying to fight these wind farms and we’ll continue to. KRISTY HANSEN: The complaints are world wide so it’s hard to believe that these complaints don’t have some element of truth to them. MARIJA JOVANOVIC: Adelaide Uni researchers are using microphones to analyse low frequency noise from turbines up to 10 km away. Early results show rumbling sounds at 46 Hz which are just audible to the human ear. KRISTY HANSEN: When the wind farm is shut down those peaks just don’t exist. A two month investigation by the State’s environmental watchdog found no evidence linking wind farms to adverse health impacts. But critics say that study was flawed as just one microphone was used instead of several to average out sound in different parts of a room. Microphones close to trees outside also skewed the data. KRISTY HANSEN: This can cause the noise levels to be higher than they actually are when the wind farm is shut down. MARIJA JOVANOVIC: For the locals it is acknowledgement at long last of their complaints. And while it may be too late for those living near existing turbines, it is hoped that the findings will stop those proposed elsewhere. Marija Jovanovic, Seven News. Can’t get infrasound on a regular decibel meter. They need to use a special one. Is there anyone on here that has experienced the health effects first hand? we are a family on Lord Howe island fighting our local council against the installation of wind turbines 250 metres from residents homes. We are trying to educate and inform residents of the infrasound, low frequency ect but think having a letter written to the residents explaining what they have gone theough may make people realise it can happen and not to risk it. The council has paid a consultancy group Jacobson to community consult and say NO health effects. Put you comment on the latest post, that way you will have the best chance of a response. It’s never too late and long overdue, to protect people from exposure to annoying, sleep depriving and health damaging industrial noise, regardless of its source. If you have a mouse plague, take the food source away and the mice go away. Take the REC away, and the wind weasel and greentard goons are gone. All we have to do then is round up all the corrupt scum and deal with them – give them back some of their own medicine, and let them suffer like HELL in the jail cells near wind turbines so the infrasound and low frequency noise can do it’s work. Couldn’t think of a better place for the scum bags.